Getting back to the basics of collecting, 2015-16 Panini Complete Basketball is a simple release with a large base set. Boxes average one parallel per pack and one insert per box. While Hoops has assumed the role of the main low-end option for NBA collectors and Donruss is another option, Panini Complete takes that to another level with a format almost entirely based around base, parallels and basic inserts. The 330-card base set takes a detailed look at the league, including top veterans and the biggest rookie names. Silver (one per pack) and Gold parallels (1:36 packs) add a splash of color to the borders. A total of six insert sets offer set collectors a decent challenge. Among these, Home and Away inserts feature top players in their two main uniform options. Court Vision includes a larger action image while Craftsmen highlights the specialty for each player. There is also a special insert that features top players and personalities giving back as part of the NBA Cares Program. Given the low-end focus, Autographs are not a major component but are still available in limited fashion. Dropping one per case, collectors can find sticker autographs for top stars like Kobe Bryant, Kevin Durant and Anthony Davis along with key 2015-16 rookies like Karl-Anthony Towns and Jahlil Okafor. KARL-ANTHONY TOWNS RC 2015-16 PANINI COMPLETE SILVER #303 BGS 9.5 w 2 x 10 subs! 330 cards. Shop for full base sets on eBay. Kaizen Rodriguez � It was scheduled to release today but it looks like it got pushed back to Friday. Silver & Gold parallels just in time for Christmas! I’m actually looking forward to seeing these cards. 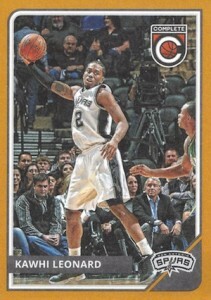 I was not a fan of 14-15 Donruss and I am wondering if this is going to be this years “Hoops 2.0” as some have called other low end releases over the last few years(like Panini Basketball from 12-13 and 13-14). Hallco � They look very simple. Not quite Hoops 2.0 based on what I have seen. Well….simple design can still be decent overall. Those of us who collect basketball for the hobby first without dependence on “ROI”(there aren’t a lot,but I know a few) tend to appreciate the action shots, good photography and quality control. But…hearing you say that you have seen them makes me think it’s just more wasted paper being rolled out in the Panini presses! Lol. Thanks for the information! Panini accomplished what they wanted with this set. They wanted to set a new low end precedent, and they did. The entire feel of the product shows an effort to create a low cost, low end experience. From the ultra thin card stock to the rarity of even the simplest inserts it screams low end, big set, huge work to master. As someone who is a fan of the game as well as a collector I love it. The card stock doesn’t bother me as I sleeve my sets, and long-term this will be a very condition sensitive set. The best part is that the price matches the product. Mission accomplished. Come on now…are you SURE this is a Panini product? This looks like a Topps product to me. Bought a few of these packs retail, and was less than impressed. I truly think someone from Topps was either holding the Panini folks at gunpoint, or “knows something” about them. Better luck next year. Although the look is simple, I kinda like it. I wish it didn’t have that goofy C on it. I bought a $10.00 retail box at Kmart & pulled a Chris Paul auto. No complaints here. I was shocked when I opened the pack and looked at the stock that this product was made on. It is 2016, but the technology that this stuff is printed on looks like the early 50’s. ONLY for a pre teen beginning to collect would I recommend this set. A little pricey but the card stock is thin but flexible and sturdy. It is a joy to hold a card that does not have foil and glossy stock that comes off on your hand. 4 Stars. I like these cards. Very basic, and overall good photos. In regards to the NBA Cares Subset, was no #4 made, and does #2 Dikembe Mutombo exist? I have not seen either in putting a set together.